Free users are able to view and write up to 5 Orders per month. Here's a breakdown of what this means. Your buyers will never be locked out from viewing your presentations or placing orders. You can collect unlimited orders placed by Buyers in your Orders Page, but if you are a Free user, you won't be able to view them all. Free users can only view and write up to 5 Orders per month. You can either wait for the month to end or upgrade to a paid subscription to access more. 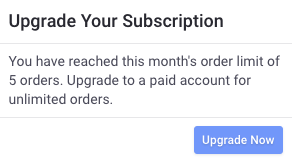 See System message: "Upgrade Your Subscription: (User) has reached this month's order limit of 3 orders. Upgrade to a paid account for unlimited orders" for more info.